For much of its life, Duluth’s Storey Taxidermist along East Sixth Street was operated by Thomas J. Storey, one of two sons of Dr. Thomas Henry Storey who followed their father into the family trade. The elder Storey was himself a taxidermist but became better known as an early practitioner of chiropractic medicine who is both credited with inventing a vital tool of the trade and discredited for his controversial—and sometimes paralyzing—adjustment techniques. Born in Ontario, Canada, in 1843, Thomas H. Storey established himself as a taxidermist in Duluth in the 1880s (a 1952 advertisement for the business includes the phrase “Since 1882”) and by 1890 was operating a taxidermy business out of 28 East Superior Street under the name Storey & Williams, reflecting his brief partnership with William H. Williams. 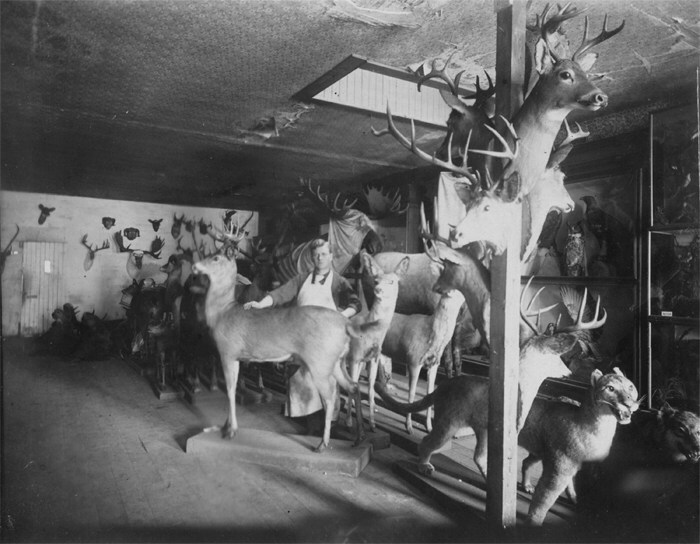 Storey (and possibly Williams) contributed to the taxidermy exhibit representing Duluth and St. Louis County at the 1893 World’s Exhibition in Chicago. In an 1893 letter to the Duluth News Tribune, Duluthian Ralph McKenzie reported what he had observed at the event, stating that “In the Minnesota building J. F. Storey, the Duluth taxidermist, has a complete display of specimens of Minnesota birds and animals…. [as well as] one of the largest mooses [sic] upon record…[and] a specimen of the largest elk on record, which for a long time adorned one of the front windows of a Duluth drug store…occupies a place of honor here in the taxidermist collection.” We can only assume that Mr. McKenzie was mistaken about Storey’s initials, and indeed records show Thomas H. Storey listed among members of the Minnesota Board of World’s Fair Managers. A 1909 advertisement for Thomas J. Storey—who was running for alderman at the time—states that he had been a practicing taxidermist for 20 years, which meant he entered the family business in 1889 when he was just 14 years old. His younger brother Frank also started in the trade at an early age. Storey Taxidermist later moved to 227 East Superior Street—one of the buildings that was replaced by the Hotel Duluth in 1926—and stayed until 1921, when the business moved to 611 Sixth Avenue East. It has stayed there ever since. Akin to magnetic healing, vitapathy also encompassed the use of many folk-medicine approaches. Campbell believed the healing power came in at the crown of the head and, as hair was a non conductor, the patient must part his or her hair in the middle. The students were forbidden to divulge the contents of his books or to show his books to anyone. Storey also taught Reisland the “mallet-and-chisel” method of adjusting the spine. Just as it sounds, Storey placed wooden sticks or “chisels” against certain vertebrae and whacked them with a mallet in an attempt to realign the spine. According to Smith, Palmer was “not an enthusiastic supporter” of the method—he, like many of his contemporaries, he believed that true chiropractic methods did not involve manipulation by devices other than the hand (Storey is known among chiropractors today as the “father of instrument adjusting”). Reisling would later found an association that became the first American Chiropractic Association. He would also face charges after paralyzing a patient lower limbs while using the mallet-and-chisel method—as would his mentor. Smith’s article contains a detailed account of Storey’s life and questionable medical career, which begins to take an even odder turn in 1902 shortly after the death of his infant granddaughter. Storey wrote his wife a quick note, withdrew several thousand dollars from the bank, and disappeared. He ended up in Seattle, found “acting strangely” on a train. He next sent word to Palmer that he was heading to Los Angeles. Worried, Palmer went after him and was fortunate to spot Storey on a streetcar, “his face was bloated; an eye blackened from a bruise; his clothing was soiled and unkept.” Storey told his friend that he had been under the control of “the other fellow” and described what we might today consider symptoms of multiple-personality disorder or perhaps schizophrenia. His last memory was speaking to his son in Duluth and he had no idea how he ended up in California. During Storey’s disappearance his office was broken into no less than three times. He never returned to the Zenith City. Thomas and Frank stayed in Duluth, both working as taxidermists, while other siblings followed their father west. In Los Angles Storey started practicing his unique healing methods almost immediately (Smiths suggests that this possibly makes Storey the first practicing chiropractor in California). 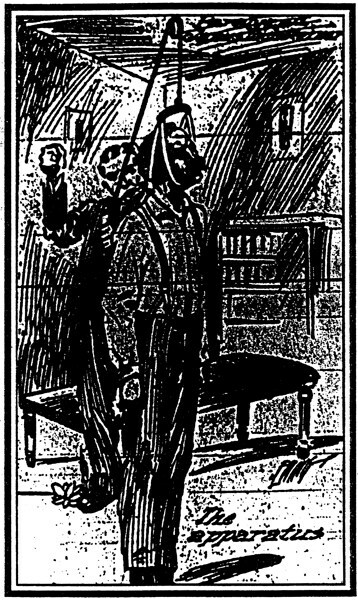 Besides electricity and the mallet-and-chisel technique, Storey also began using the “hanging cure,” suspending patients by their head in order to straighten their spines. By 1905 Los Angeles authorities were attempting to convict Storey of practicing without a license. A young man who fell off a bridge and damaged his spine sought pain relief from Storey, who applied the hanging cure and repeatedly hit the patient in the neck to force the broken bones into position. After the patient collapsed, Storey applied electricity. By the time the treatment was over, his patient was a “hopeless cripple,” paralyzed from the waist down. Storey was subsequently charged and found guilty of practicing without a license. An appeal was denied and in the end he was fined $500, about $13,000 today. He continued his controversial practice. In 1907 he used the mallet-and-chisel method to adjust Domenick Premus and cure him of “some type of kidney and liver ailment;” Premus died within an hour of the treatment. Thomas H. Storey died in 1923 with his estate in shambles. It took many years and the efforts of several attorneys to straighten out the chiropractor’s estate. After his father became a vitapathic physician in 1897, Thomas J. Storey took over the family business and remained a taxidermist the rest of his life. Frank Storey also kept at the family trade, working with Thomas on Superior Street until at least 1914. He later operated his own taxidermy business out of his home at 2518 West Third Street. Frank Storey died in 1954. In September 1937 the Duluth Herald ran an article about Thomas J. Storey, who at the time had been contacted by the Smithsonian Institute, which was looking for stuffed specimens of record-sized fish. The Smithsonian, Chicago’s Field Museum, and the National Geographic Society had all taken notice of the quality of Storey’s work and his technique—inspired by rag dolls—of using saw dust for the “stuffing” of his mounted fish. The method gave his work a much more lifelike quality. Although records are not clear, Thomas J. Storey likely passed away in 1948, the same year George Flaim purchased Storey Taxidermist. Flaim operated the business for 30 years before selling to Jim Hagstrom, Sr., in 1978. Hagstrom still operates Storey Taxidermist, although on a limited basis.